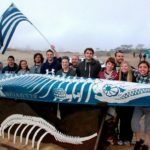 Students from École de technologie supérieure receive a check for $5,000 in scholarship money for winning the 26th Annual ASCE National Concrete Canoe Competition place June 20-22 at the University of Illinois at Urbana-Champaign. After finishing either second or third three times over the previous four years, the fifth time proved to be a charm as École de technologie supérieure was crowned champion of the 26th Annual ASCE National Concrete Canoe Competition (NCCC) taking place June 20-22 at the University of Illinois at Urbana-Champaign. They became the first international civil engineering school to win the competition since it started in 1988. The Montreal, Quebec-based engineering school that boasts over 7,000 students won the competition and took home the top prize of $5,000 in scholarship money with their 20-foot, 165-pound canoe named Savannah. Scoring a total of 64.0 points, École de technologie supérieure and their colorful black, brown, orange, red and yellow canoe, beat out the University of Nevada, Reno who finished second with 61.5 points and earned $2,500. Finishing third with 60.5 points and receiving $1,500 was the University of Florida. 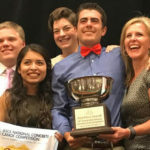 California Polytechnic State University, San Luis Obispo, which won the NCCC the past three years, came in fourth with 57.5 points, tied with Utah State University and each received a commemorative plaque. According to École de technologie supérieure’s Concrete Canoe 2013 Design Paper, the cost of design, construction, management, development, and testing was approximately $40,000. 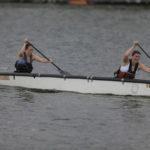 Throughout the years, they managed to build an impressive reputation by winning the Canadian National Concrete Canoe Competition four times in its history, as well as qualifying for NCCC on many occasions but never finishing first. The project design paper went on to state, “However, in spite of the successful accomplishments of the past, for far too long the team has suffered many recurring weaknesses that, over the years, have kept them from obtaining the highest level on the podium. “When they announced that we won, we all burst into tears and yelling; it actually was the best moment of my life, I could not believe it” said Jean-Luc Martel, A.M.ASCE, the captain of École de technologie supérieure team. “To see the faces of all my teammates being so happy, we did not think it was even possible to win the competition in the first place. Our university, which is located in Montreal, is so small that sometimes you cannot even find it on the map. “All of this have would not have been possible without the help of all the students and team captains that have been working on this project over the past few years”. ASCE student chapters from 23 schools across the U.S. fielded teams for the NCCC, a “think or swim” contest of academic and athletic skill in which students design, construct, and race canoes built out of concrete. Winners are determined by combining points earned in 4 key areas of engineering knowhow: 25 percent of each team’s score is based on the engineering design and construction principles used in the creation of their concrete canoe; 25 percent is based on a technical design report that details the planning, development, testing, and construction of the canoe; 25 percent is based on a formal business presentation that highlights the canoe’s design, construction, racing ability, and other innovative features; and the final 25 percent is based on the performance of the canoe in 5 different canoe races—the women’s and men’s slalom/endurance races and the women’s, men’s, and co-ed sprint races. However, due to inclement weather impacting the safety of the participants, no sprint races were held this year. To qualify and get to the national level, more than 200 teams had to compete in 18 regional conference competitions this past spring. To be eligible to compete, the student entrants must be members of their school’s recognized ASCE Student Chapter or ASCE International Student Group. In its 26-year history, the NCCC has attracted more than 500 teams and over 6,000 engineering students. The teams that competed this year included, Clemson University; Mississippi State University; California Polytechnic State University, San Luis Obispo; California State Polytechnic University, Pomona; California State University, Sacramento; École de technologie supérieure; Fairmont State University; Michigan Technological University; New Jersey Institute of Technology; Ohio Northern University; University of Evansville; University of Florida; University of Illinois Urbana-Champaign; University of Massachusetts Lowell; University of Nevada, Reno; University of Oklahoma; University of Pittsburgh at Johnstown; University of Puerto Rico, Mayaguez; University of Texas at Tyler; University of Washington; University of Wisconsin – Platteville; Utah State University; and Youngstown State University. Judging the competition were Robert W. Barnes, Ph.D., P.E., M.ASCE, associate professor in the Department of Civil Engineering at Auburn University; Cesar A. Constantino, Ph.D., M.ASCE, senior director of process and quality with Titan America LLC; Corey L. Haeder, P.E., M.ASCE, chief engineer with Cretex Concrete Products; Kevin MacDonald, president and principal engineer with Beton Consulting Engineers LLC; and Serji Amirkhanian, Ph.D., A.M.ASCE, director of research and development for Phoenix Industries. The NCCC was sponsored this year by the ASCE Foundation, the American Concrete Institute, GEICO, Dassault Systèmes SolidWorks Corporation, and World of Concrete. 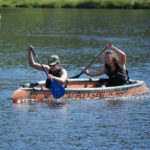 Complete results and information about ASCE’s National Concrete Canoe Competition can be found at the official website.